simple thank you goes a long way. This World Humanitarian Day, recognized on Aug. 19, IMA World Health is taking a moment to show appreciation for the 287 field-staff members ensuring health, healing and well-being in some of the most challenging areas of the world. The work IMA does in the Democratic Republic of Congo, Haiti, Indonesia, Kenya, South Sudan, Tanzania and other locations would not be possible without the unsung heroes who remain undaunted in their efforts to serve some of the most vulnerable people in the world. Many IMA staff members, like Patrick Shatshi, approach their jobs as a way to pay it forward. Shatshi started out as an unskilled worker. 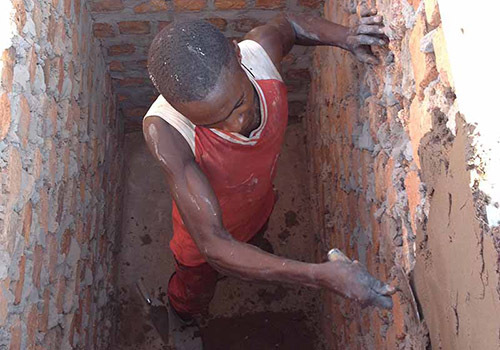 With his fourth baby on the way, 28-year-old Shatshi joined the Access to Primary Health Care Project’s construction team to build the health center in his village of Kibulungu, one hour by motorcycle from the provincial capital of Kasaï in the Democratic Republic of Congo. Shatshi was determined to be a part of his community’s effort—with the help of ASSP and funding from the UK’s Department for International Development—to construct a much-needed health center. It was also important to him to be on the team that constructed the health center where his wife, Clarisse, would safely give birth to their new daughter. He succeeded! The construction on his health center was completed in August 2014 and his wife gave birth in October. The health center of Kibulungu serves a population of more than 14,000 people and provides care to more than 700 people in need per month. Since joining the ASSP team almost three years ago, Shatshi has continued, along with many other unsung heroes, to strengthen the remote communities around him. Those communities may be barely accessible through jungle, by nearly impassable road and across rivers with canoes hewn from logs as ferries. Shatshi’s enthusiastic and tireless drive earned him a promotion to mason, the highest level on the job site before entering management. 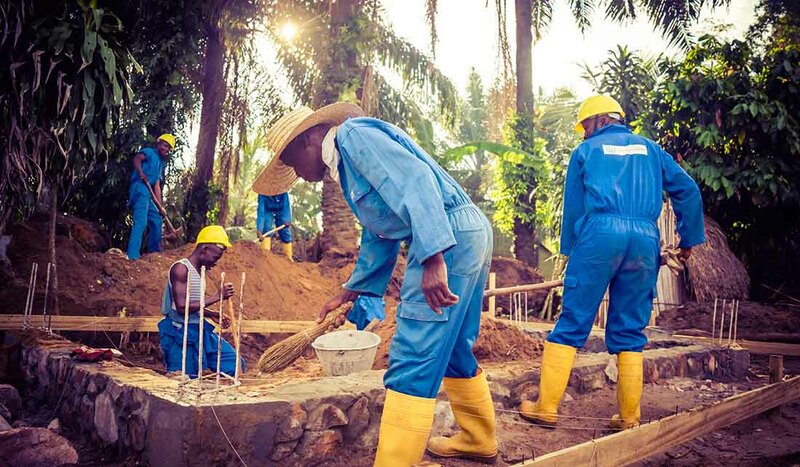 With his new skills, he now builds the infrastructure that ensures health, healing and well-being for his community. 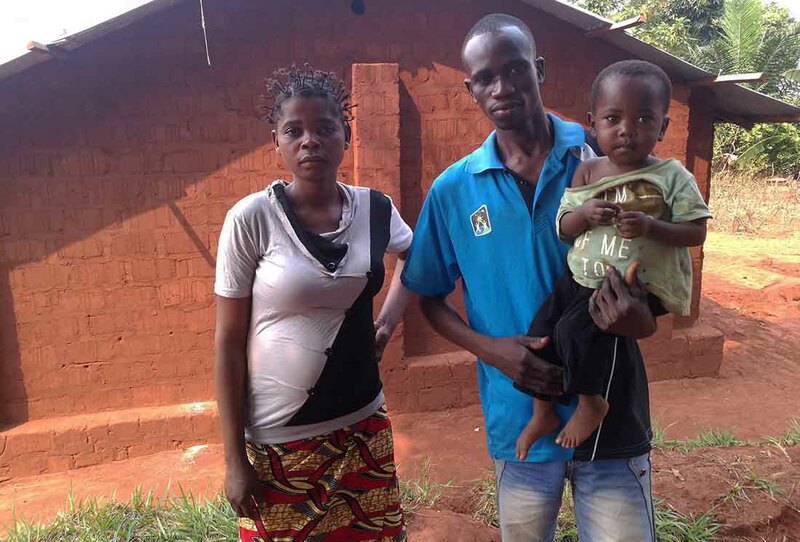 Patrick Shatshi helped to build the health center where his wife, Charlotte, gave birth to their fourth child in the village of Kibulungu in the Democratic Republic of Congo. Patrick Shatshi did not mix cement, lay bricks in the hot sun, or pound nails for personal glory. His commitment was focused on his wife, his daughter and his community. For other field staff, having the opportunity to reach people who might not otherwise be reached is what drives them. 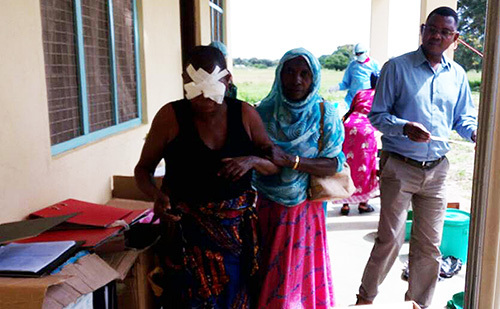 In IMA’s Tanzania office, Alex S. Msumanje looks forward to working with elderly patients who suffer from trachoma-related conditions in his role as program manager of the SAFE Project. IMA is the lead implementing partner in the Mtwara region of Tanzania on the SAFE project, which is coordinated by Helen Keller International. The project follows the World Health Organization-endorsed SAFE strategy—Surgery, Antibiotics, Facial Cleanliness and Environmental Improvements—to address the underlying causes of trachoma. IMA addresses the backlog of trichiasis trachomatous cases, in which eyelashes have turned inward and scrape the surface of the eye. In such cases, surgery is required to relieve pain and prevent blindness. Msumanje is involved in planning and overseeing project implementations and often joins the surgery team, sharing the challenges and successes in running the outreach camps. In IMA’s Tanzania office, Alex S. Msumanje looks forward to working with elderly patients who suffer from trachoma-related conditions in his role as program manager of the SAFE Project. He enjoys having the chance to help ease the minds of elderly patients who are nervous about receiving treatment for trachoma-related diseases. Most elderly patients he encounters have limited access to almost everything, including health care services and lack close relatives to help them. When they arrive in an outreach camp, they’re often getting the chance to socialize, as well as get the treatment they need. Because of unsung heroes, like Msumanje and others on the SAFE project, some of the most vulnerable people in Tanzania have access to services that improve their health and well-being. Msumanje and Shatshi are two examples of the dedicated field staff who go above and beyond to build healthier communities by collaborating with key partners to serve vulnerable people. On behalf of all the people they enable IMA to reach every day, we extend a simple thank you for everything they do. Gifts made to IMA World Health support our entire mission of health, healing and well-being, and they will be directed to where they are most needed. Gifts to IMA World Health are tax-deductible as allowed by U.S. law.